Portable electronic applications, including wireless communication, imaging and video, demand high-resolution (≥12b) and low-distortion analog-to-digital conversion with a signal bandwidth of tens of MHz. The pipeline ADC architecture is popular because it achieves both high resolution and high speed. However, pipeline ADCs rely on good component matching and require high-gain and high-bandwidth op-amps to achieve good performance . Furthermore, aggressive device scaling in modern CMOS technology, coupled with low supply voltage operation, has made the design of op-amps difficult. Digital calibration schemes and comparator-based op-amp techniques have been proposed to overcome these limitations. Nevertheless, SAR converters have surpassed pipeline converters in terms of energy efficiency. Consisting of a comparator, capacitors, switches and control logic, switched-capacitor SAR ADCs have the advantage of minimal analog complexity . 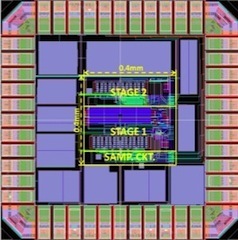 The simple analog content makes the SAR architecture well suited to nanometer CMOS processes , but SAR ADCs are limited in speed due to their serial decision making process. Furthermore, the effective resolution of SAR ADCs is limited by comparator noise and limited capacitor matching . Moderate resolution SAR ADCs suffer from a large input capacitance because large unit capacitors are required to achieve good matching. We propose a two-stage pipeline ADC architecture with a large first-stage resolution, enabled with the help of a SAR-based sub-ADC. The prototype 12b 50MS/s ADC achieves an ENOB of 10.4b at Nyquist, and an FOM of 52fJ/conversion-step. The ADC achieves low-power, high-resolution and high-speed operation without calibration. The ADC is fabricated in 65nm and 90nm CMOS and occupies a core area of only 0.16mm2.